Sometimes you need to generate temporary links - URLs that expire after a certain timespan - so that a resource indicated by the link can be accessed only for a specific period. 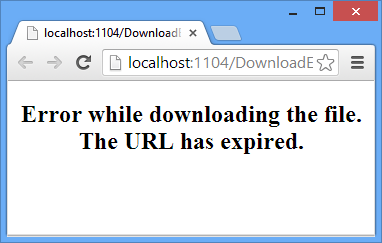 The URL if accessed after the stipulated time window refuses to serve the intended resource. Consider, for example, a user registration system that requires an email verification step. When the system sends an automated email to the user you may want that the user should confirm the email within two business days, otherwise the verification is suspended. The user is then required to get a fresh verification email or contact the administrator for further action. The same situation arises while downloading files. You may want to giveaway a few copies of the software you are developing and may want to generate temporary URLs to the downloads that expire after say 30 days. It might have been marked to expire as soon as the user downloads a file. It might have assigned a specific expiry date. The former setting is controlled by ExpireAfterDownload column (bit data type) and the later setting is controlled by ExpiryDate column (datetime data type). Finally, the Hits column stores the number of times a URL was accessed. Note that if you use ExpireAfterDownload setting you will also need to think about situations where a user initiates the download but the download fails for some reason. The URLs of the above form will be mapped to downloadfile.aspx. You will create downloadfile.aspx later in this article. The above code creates an instance of Download model class and sets its various properties. Notice the code marked in bold letters. The DownloadToken property is set to the return value of a helper function - GetDownloadToken(). The value of 10 supplied while calling GetDownloadToken() indicates the length of the download token (10 characters in this case). Once various properties of Download object are set, it is added to Downloads DbSet and SaveChanges() method is called on the context to save the changes to the database. The NavigateUrl and Text properties of a HyperLink control are set to ~/downloads/<download_token>. The GetDownloadToken() method accepts an integer parameter - length - that indicates the length of the download token. Inside, it stores the ASCII code for 0, 9, A and Z in four variables - intZero, intNine, intA and intZ. Then a Random instance is created by passing the number of Milliseconds to its constructor. This value will act as the seed value for the Random object. A while loop is then used from 0 to the intended length value. With each iteration a new random number is generated using Next() method of Random class. The parameters to the Next() method indicate min value and max value. This random number is then converted to char and appended to the downloadtoken variable. Finally, GetDownloadToken() returns the generated download token. It must be remembered that although this logic attempts to generate different download token every time it is called, it is possible that duplicate download tokens get generated. You should check the generated token against the database (not included in the above code). The DownloadFile.aspx doesn't have any UI as such. Its only purpose is to serve the requested download file if the link has not yet expired. If a link has expired it redirects the user to an error page. Inside the Page_Load event handler, the code retrieves the downloadtoken route parameter using RouteData. This will return the download token part from the URL. For example, if a URL is /downloads/ABCD, it will return ABCD. Based on this download token the corresponding record from the table is retrieved using the LINQ to Entities query. If the code so far concludes that the link is still active, the requested file is read from its location. This is done using the Url property and FileStream class. The response stream is then cleared and the entire file content is written onto the response stream using BinaryWrite() method. The response stream is then flushed and closed. Notice how the response headers - Content-Type and Content-Disposition are set. These headers will cause the browser to display download prompt to the user. The actual URL of the file is not revealed to the user. Note that the code assumes that ZIP files are being downloaded. You should change the MIME type as required. If the link was marked for expiration after downloading it once, its Downloaded property is set to true. Additionally, its Hits count is incremented. The changes are saved to the database using SaveChanges() method. That's it! 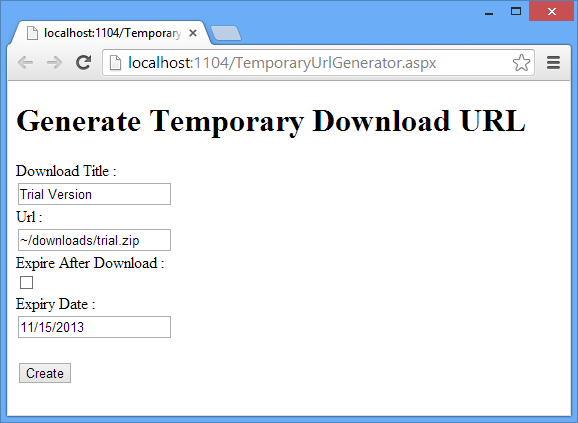 Generate a few temporary URLs and try downloading the files using the generated URLs. 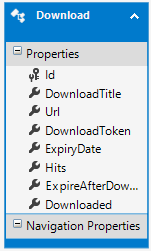 Test whether the expiration settings (ExpireAfterDownload and ExpiryDate) work as expected.